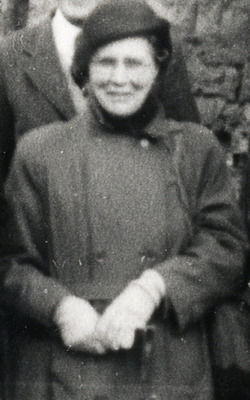 Ethel Currie as curator of the geological collections in the Hunterian Museum at the University of Glasgow, was an indefatigable cataloguer, an excellent teacher and a committed communicator in her organisation of educational exhibitions. She began a comprehensive description of the Scottish Carboniferous Goniatites 1n 1937. This was a major piece of work which gave precision to the zonal sequence of the strata, demonstrated the great gap in the Namurian series, delineated Lower from Upper Carboniferous, and proved that the rocks of the Calciferous Sandstone group in all their goniatitic horizons belong to the Viséan stage. 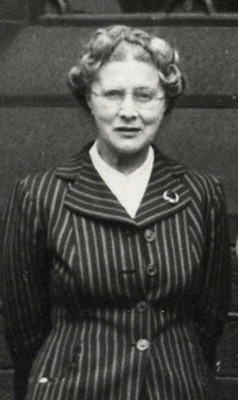 Currie was the first woman to win the Royal Society of Edinburgh Neill Prize (1945), for a paper on Jurassic ammonites, and one of the first three women to become Fellows of the Royal Society of Edinburgh in 1949. Born 4 December 1899, Glasgow, Scotland. 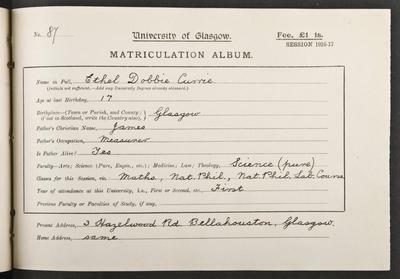 Ethel Dobbie Currie (1899-1963) was a University graduate and a distinguished geologist. She became Assistant Curator of the Hunterian Museum during the early 1920s and was promoted to the grade of Senior Lecturer in 1960. Born in Glasgow in 1899, Currie was educated at Bellahouston Academy before coming to the University to study geology during the First World War. 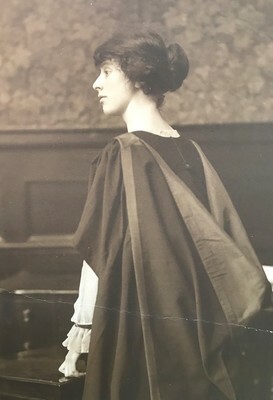 After she graduated BSc in 1920 she briefly worked as a Demonstrator in Professor John Gregory's department, before Professor Gregory invited her to assist with the care and arrangement of the geological collections in the Hunterian Museum. She accepted and held the post of Assistant Curator until she retired in September 1962. Currie's primary research interest was in the field of palaeontology, and she published a number of academic works, beginning with a joint paper with Professor Gregory on fossil sea-urchins. She received the Royal Society of Edinburgh's Neill Prize in 1945 and four years later, with Sheina Macalister Marshall, she was one of the first women to be made a Fellow, having been proposed by a number of distinguished figures including Sir Edward Bailey Balfour. In 1952 she became the first woman President of the Geological Society of Glasgow. She was acknowledged by the Geological Society of London in the award of its Wollaston Fund. George, T. N. 1963. Obituary. Transactions of the Gelogical Society of Glasgow. XXV: 98-100. 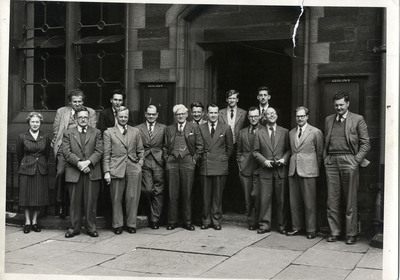 World Changing Project, "Leading the study of Scottish Carboniferous Goniatites," in University of Glasgow World Changing (University of Glasgow, 2010); http://www.worldchanging.glasgow.ac.uk/article/?id=41 (accessed April 22, 2019). World Changing Project. "Leading the study of Scottish Carboniferous Goniatites." In University of Glasgow World Changing. University of Glasgow, 2010. http://www.worldchanging.glasgow.ac.uk/article/?id=41 (accessed April 22, 2019). World Changing Project. "Leading the study of Scottish Carboniferous Goniatites." University of Glasgow World Changing. University of Glasgow, 2010. 22 April 2019 <http://www.worldchanging.glasgow.ac.uk/article/?id=41>.